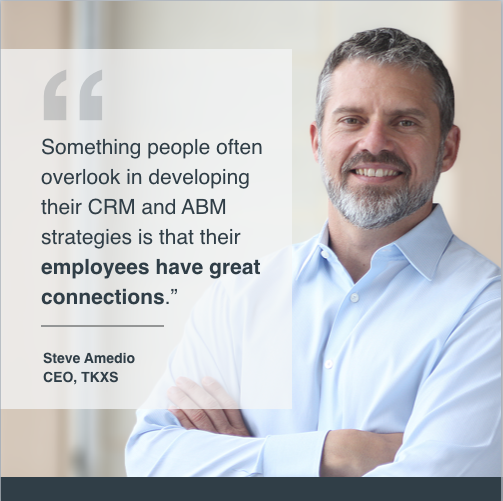 In a recent podcast with Jim Regan, CMO of MRP (Managed Resource Partners), TKXS CEO Steve Amedio discussed an unusual and effective tactic for growing a business. Here are five key takeaways from Harnessing The Power Of Who You Know. All our business could be traced back to about half a dozen relationships. We didn’t have to find new targets. We had to pay close attention to our data, use intelligent tools, and follow through with good old-fashioned marketing. In this instance, the single most effective channel was to pick up the phone and just have a chat. Conversion rates are two and three times of what we typically see. MRP provides end-to-end marketing sales and software services, including a predictive behavioral analytics service marketed under the brand name Intent™ at TKXS. Read: The Value of Conversation in Today’s High-Tech Marketing Environment.